Crawdad fishing can be just as fun as fishing for traditional fish species. Kids especially will love catching these interesting crustaceans. Crawdads can make a fine meal as well and are often referred to as 'fresh-water lobster' or 'poor man's lobster'. Crayfish are excellent bait for such species as Smallmouth and Largemouth Bass, as well as at times for many other species including Cutthroat Trout and Channel Catfish. Crawdads occupy mostly rocky or weedy shorelines where they can seek shelter from predators and feed safely. They are often found in very large numbers in some of Utah reservoirs, such as Strawberry Reservoir. Crawdads can be caught with a traditional fishing pole, however they are also often trapped as well as caught by tying bait to fishing line with no hook. The crawdads seem to want a meal so bad that they will clamp onto the bait with their claws and not let go, allowing you to bring them up out of the water. Crayfish in Utah waters are important to the overall health of our fisheries. Crayfish are food for bass in Lake Powell and gamefish in Flaming Gorge Reservoir. They can also clear weed-infested waters of algae or moss and thin out rooted plants, which sometimes improves the environment for gamefish. But prolific and aggressive crayfish compete with gamefish for food. The Utah Division of Wildlife Resources seeks to achieve and maintain balance between gamefish and crayfish populations so that each sustains but does not diminish the other. At some point, it may be necessary to limit crayfishing as we do gamefishing. For now, however, there is no limit to the number of crayfish you can legally catch or possess. You can go after them with a variety of gear in any Utah water, if you have a regular fishing license. Live crayfish cannot be transported away from the water where they were caught. Crawdads are found in the Virgin, Price, Bear, Duchesne, Weber and Green river basins, among others. In the Sevier drainage, the freshwater crustaceans have only recently gained a foothold. 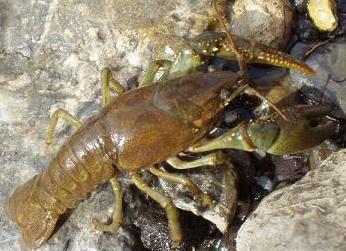 There are plenty of other Utah waters that also contain varying numbers of crayfish as well. steps must be taken to kill and preserve them. Utah law forbids the transportation of live crayfish. They must be killed where they are caught to prevent their being introduced into waters where they are not wanted. Cleanliness is equally important to maintain freshness and flavor. Crayfish, like crab and lobster, have a rough shell and many joints where silt and algae can lodge. Thorough cleaning in the field is not practical, nor is it important if the crayfish body is kept intact. If, however, only the tails are kept, contamination may get into the meat. Another good reason for saving the body is the super-tasty meat in the claws and the nutritious, delicious internal organs and juices which can be used to flavor some dishes and soups. Keep the accumulating catch alive until the end of the fishing day. As they are caught, pack the crayfish rather tightly in a large container between layers of moist fabric, such as gunnysacks. This reduces cannibalism among the crayfish. It is a good idea to put ice between the layers of fabric but not directly on the crayfish. At the end of the day, discard any dead or mutilated crayfish and kill the keepers painlessly and quickly by stabbing each one firmly with a kitchen knife on the top, where the head joins the body. In a large pot with plenty of cold, clean water, wash the whole crayfish vigorously to remove surface dirt even if you only wish to keep the tails. Rinse thoroughly in another pot of fresh, cold water. Now remove the tails, if you want to. Pack whole crayfish or crayfish tails in alternate layers of ice and filter in a large, prechilled ice chest so they do not touch ice or stand in water. The chest should have a false bottom with at least four inches of space under it. Wood slats or hardware cloth nailed to 1" x 2" crossmembers will serve that purpose. Lay a plastic garbage bag on the bottom to prevent water from splashing upward, then place crayfish two or three deep. Cover with plastic or newspaper, add two inches of ice, cover with another layer of plastic or newspaper, and then add more crayfish. Repeat until all your crayfish are packed. Top with ice. Leave the ice chest drain valve open until you are ready to load your vehicle. After the ice chest is packed, don't open it again until you are ready to process the crayfish or transfer them to other refrigeration. When you get your catch home, put the ice chest in a cool place and open the drain valve. The faster you can process the crayfish the better. If you can't process them for several hours, transfer the crayfish to plastic bags and store them in a cold refrigerator. Discard any crayfish that are too soft or otherwise suspect. In very cold water scrub them, particularly their bottoms, until they look clean. Rinse thoroughly. To remove the thin, black intestine from the tail, grasp the top, middle tail fin (there are five fins), twist and pull. The vein should come out with the fin. Soak the crayfish in a strong salt solution for five minutes or more to further cleanse them and firm the flesh. Rinse. Now, you must decide among several options, including whether to leave the crayfish whole or remove the tails. Option one: Decide how many crayfish your catch will serve, allowing about 24 per serving. Get on the phone and invite your friends to a crayfish bash. Refer to the cooking crayfish section of this brochure for serving instructions. Option two: Pack uncooked, whole tails, peeled or not, in bags and freeze quickly. Peeled tails should be dipped in a solution of one-quarter cup lemon juice to one cup water to prevent discoloration. Freeze a few whole crayfish for decorating dishes you prepare later. Option three: Cook your crayfish before you freeze them. In a large pot, bring one gallon of water and one-half cup salt to a boil. Add about two quarts of crayfish and bring back to a boil. Simmer, covered until crayfish turn red and rise to the surface � about five minutes. Remove all crayfish at once and cook additional batches in the same water. Peel the tails while they are still warm (unless you are freezing them whole). Chill cooked crayfish in ice water, then bag and freeze. Leave the nutrient-rich, flavorful fat attached to the tails if they are to be eaten fresh. Remove the fat to minimize spoilage if you are freezing the tails. For uncooked tails, slit the bottom shell from front to fins with sharp-nosed scissors. Devein as described previously, and peel off the shell. For cooked tails, proceed as follows while the crayfish are still warm from the boil. Separate the tail from the body by slightly twisting and pulling the tail,from the head. Hold the tail lengthwise between thumb and forefinger and squeeze. You may hear the tail crack. Grasp the lower tailfin pads from the side and loosen by lifting up and pulling around the meat. This piece can easily be pulled off and discarded. Firmly grasp the last segment and tailfin with the thumb and forefinger of one hand. Gently pull the meat out of the shell with the other hand. The vein will pull free from the meat. Inside the head of the crayfish on either side are two pockets of a substance called the "butter." It is brilliant yellow or orange in color and, used in recipes calling for butter, improves both appearance and flavor. To remove the butter, open the crayfish head slightly and lift the butter out with a small spoon. It should be used immediately because it spoils quickly even when frozen. Flavored only with salt, boiled crayfish are ready to use in dips, cocktails, and salads or in general recipes, the same as you would use boiled shrimp, crab, or lobster meat. Boiled crayfish are also ready for freezing or canning. Boil according to instructions in Option Three of the washing and deveining section. These are used generally "as is" for snacks or hors d'oeuvres or to top fresh, green salad. The writer is partial to the following recipe for spiced crayfish: Combine one gallon of water, one cup salt, and one-half cup wine vinegar; add one-half cup pickling spices in a cheese cloth bag. Boil raw crayfish for five minutes only; remove and chill in ice water. Return to cold cooking liquor and store or pack in jars following standard canning instructions. You may not use game fish or their parts for bait, or use any substance that is illegal for fishing. Seines (nets) may not exceed 10 feet in length or width. You may not transport live crayfish away from the body of water where you captured them. Fishing with a live Crawdad as bait is legal only if used on the exact same water where caught. The last one, chicken bones, I find to be extremely productive. Often, when fishing for crawdads, they end up stealing the bait off the line, and the bait begins to break up. A good way to get around this is to buy some cooked chicked drumsticks, and use the meat until it's gone, then use the bones. I found this out one late night at Flaming Gorge Reservoir. We had run out of bait, and decided we might as well try using the bones. They turned out to attract the crayfish just as much as the meat, but the bone held together indefinitely, so we were able to catch far more 'dads with the bones.